Only Russian fare allowed. Vladimir Putin has banned most Western food imports. 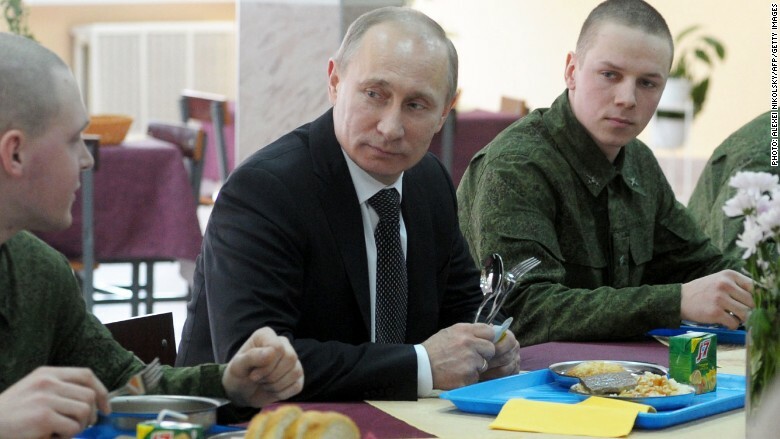 Vladimir Putin really doesn't want Russians to eat French brie. Or Canadian bacon. Or any of the items he banned. The Russian president has ordered authorities to destroy all banned Western food smuggled into the country. Moscow banned most food imports from the U.S., European Union, Canada, Australia, and other countries last year, in retaliation for Western sanctions imposed on Russia over its involvement in the crisis in Ukraine. But Russian food producers and farmers have complained the embargo is not being enforced properly. The government says banned products are still finding their way onto Russian supermarket shelves even after shipments are sent back at the border. So it has decided to get tough. According to the presidential decree published by the Kremlin, the destruction will be supervised by two officials, and documented on video and in photos. The decree doesn't specify exactly how the food will be destroyed. But Russian media reported some items, such as cheese and meet, will be burned in incinerators. Border police will also start inspecting food warehouses and supermarkets, looking for smuggled foods. Related: How badly have sanctions hit Russia? Critics of the government say the confiscated food should be used to feed the poor, rather then destroyed. "Russian pensioners, veterans, families with many children, the disabled and other needy citizens are hurt as a result of these sanctions, and forced to restrict their diet up to starvation," wrote Olga Savelieva in a letter to the government. "If the food can simply be eaten, why destroy it?" Savelieva has organized a petition against the decree. So far over 200,000 people have signed it. The ban on commercial food imports is hurting both sides. Russia was one of the most important markets for European farmers -- total exports of food and agricultural products to Russia were worth $13 billion in 2013. The EU estimates sanctions are costing its exporters around $5.4 billion per year. Fruit and vegetable farmers and cheese makers are among the worst hit. The EU is trying to compensate its farmers. It has already spent around $170 million paying farmers to give away or destroy produce to stop prices from collapsing. But Russian consumers are also hurting. Apart from being unable to buy imported cheese, fruit, meat and other products, Russians saw food prices skyrocket by 20% in the year to July, official data show. Moscow extended the embargo for another year, until August 2016, after the EU said in June it would extend its sanctions against Russia until January 2016. Russian police have seized more than 550 tonnes of food so far this year, including 460 kilograms of cheese taken from a man who tried to smuggle it in from Poland in his car in July. He claimed the cheese was for his personal use and therefore not covered by the ban.